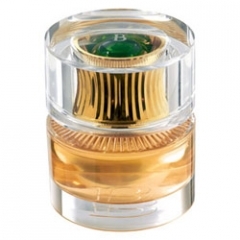 B (Eau de Parfum) is a popular perfume by Boucheron for women and was released in 2008. The scent is floral-spicy. The production was apparently discontinued. This scent is so lovely and romantic. I picture a pretty young girl in a white dress quietly sitting in a garden filled with osmanthus bushes in full bloom. The wind gently caresses the blossoms, the sun is warm. The girl closes her eyes and let the world drift away as she is daydreaming about far away places. The scent is really beautiful, tender and soft. I am able to enjoy its soft and dreamy notes without feeling overpowered. The scent is not loud but it is definitely not boring or generic to me. I love the apricot and osmanthus notes in the opening. The composition is fresh, slightly sweet and tender. The scent is very graceful and delightful to wear. The apricot note is very well done and the scent definitely does not smell like a fruit cake. Slowly the fragrance transfers into a gentle floral heart of roses. The rose note is also very light and fresh. The osmanthus note wraps around the rose bouquet like a soft floral mist. I also smell tiny bit of patchouli. It is not that noticeable here but it adds a nice touch to the floral bouquet. There is a lovely, creamy and soft woods feel to the base that I just love. The sillage is close to the skin but very pleasant. The longevity is medium. I definitely recommend this scent if you are looking for a gentle, high-quality floral. I get lots of compliments whenever I wear it. Thanks to Awesomeness for her great review that prompted me to try this gem. As she said, this is a very versatile perfume. I think it strikes just the right balance between a modern (and grown-up) fruity floral and a classic floriental. It could also very easily be a day-to-night scent, appropriate for all but the most casual occasions. The apricot note in here is simply scrumptious, creamy, jammy and sweet/tart. I find it to be the most distinguishing note in this scent. The florals are soft, smooth and understated. The patchouli and spices add depth and complexity and, I think, mesh particularly well with the apricot note. Overall, B has a smooth elegant feel that is rich, but not at all heavy or overbearing. It's really hard for me to imagine anyone not being pleased with this scent. I think it would actually make a great perfume to give as a gift. To say that it would be a "safe" choice makes it sound boring, which it is not. I do believe, though, that it would have broad appeal, while still being distinctive and something not everyone is wearing. Plus, it smells and looks expensive even though you can find it for a very good price. Really, what more could you ask for? Gorgeous, rich & lush woody for the ladies. I find most woodies to be either too thin & austere or too syrupy & forced. B de Boucheron doesn't have those qualities. The apricot and osmanthus are spot-on for the current trend in fragrance. The florals (rose, orange blossom) & spices (pink pepper) are so well-blended that I struggle to pick them out individually, although I know they are there. However, the base (sweet woods & patch) and the apricot really define the scent. Initially I thought the cedar was just a tad too dominant for me, but now I have grown to love it. I think many perfumistas would find this scent a bore and consider it treading well-worn territory. However, for me, B is something that I reach for over and over again. It is so much better than 95% of the stuff in the mass market, and it's available at an excellent price to boot. Nice projection, even from top to bottom, and lasts 6-8 hours on me. The quality of the ingredients seems to be top-shelf. I've tried most of the Boucheron femmes and haven't liked a single one. B is different. It's a grower, and can stretch from morning to night, casual to formal, winter to summer. It's easy-to-wear and accessible. Reminds me of John Varvatos but not as sweet, Badgley Mischka but not as fruity, and Tresor but softer & rounder & deeper. I love those fragrances but I love B even more. B "won" on a side-by-side test with each. In my top 10. It's so me, but better. Signature scent worthy. Write the first Review for B (Eau de Parfum)!